EMV is a new global standard for credit and debit payment cards based on chip card technology. Widely used in Europe and Canada there are over 1.65 Billion EMV-compliant payment cards in circulation today. 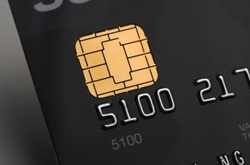 Payment chip cards contain an embedded microprocessor. The square on the front of the card is known as the card’s contact point. A microprocessor chip is embedded in a small space directly behind the contact plate. When inserted into a credit card processing terminal it will process the payment through the secured EMV network. An EMV chip card is inserted into a front loading slot on an EMV equipped POS terminal. The machine will read the cards chip or contact point and securely encrypt the data and immediately process the payment through the EMV network. EMV chip card reader equipped POS terminals are inexpensive and should not be overlooked when upgrading your payment acceptance methods. You will also gain the loyalty and trust of customers choosing to utilize this more secure payment method.